I can’t tell you how many times I’ve been asked that question over the years! Knowing when to invite a new four-legged friend into your life is a personal decision that only you can make. But it breaks my heart when a person chooses a “fur free” existence out of a sense of loyalty to an animal that has passed on. In 1995, after I lost my dearest dog, Martha, I was so heartbroken I couldn’t think about bringing home another dog. 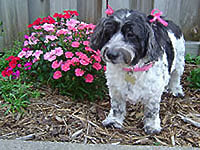 I still had 15 year-old Gypsy in my life – my shy little shadow dog. She was quite deaf and couldn’t see well, either. She had always lived in the background, letting the other three dogs take center stage. After losing Penny, Jessie and then Martha, I thought I would let Gypsy live out her final days in peace and quiet. That’s when I found myself at the animal shelter, adopting Jake. It had only been 7 weeks since Martha had left me, and although I worried about Gypsy I simply knew I was meant to bring Jake home with me. It was the best decision I ever made – for me AND for Gypsy! Jake was very respectful of Gypsy. It’s not that he thought of her as dominant, he just realized she had a sacred space in the home. And for the first time, Gypsy came out of her shell and positively BLOOMED! Suddenly she was interested in car rides, and she and Jake travelled with me often during that time. She lived another 1 ½ years – and they were the best years of her life! Along with her email came this picture of Reggie – her new puppy – asleep in her shoes. I really do believe that animals are giving, joyous creatures. They want us to be happy – and are delighted to know another critter will get to share all the love we have to offer. It’s harder for human beings to understand this. I think we tend to be less generous with our love.